Group 3 Character Sheets. Posted by TheDudeAbides. All group 3 character descriptions must be posted here and NOT in your description. ONLY POST WHAT I APPROVE TO YOUR PUBLIC CHARACTER DESCRIPTION. This message was last edited by the GM at 00:56, Sat 19 July 2014. Physical Description: Belaern is a pale figure, whose body is marred with the many scars of childhood and adolescence. Tattoos adorn his skin, often in reference to astrological events and symbols. He is clad in paltry, black robes, with a pair of worn-out boots upon his feet. His blood-red eyes are striking, full of madness and deceit. Upon his hands he wears no gloves, revealing the ugly flesh beneath-- pale and scarred, blood vessels bulging, long fingers with sharpened nails, and frankly unclean. The long ears of this elf are pierced and plagued with metallic adornments, up and down them. His long, sleek face appears emaciated and unattractive. A pair of wrinkled, faded-pink lips guard opposing rows of blackened, sharpened teeth. Background: If Belaern had been raised by wolves, perhaps he would have been a better man. Suffering through a miserable childhood, Belaern's only solace was found in the stars above. In his dreams, he would rise and float among them-- dancing with shadows along a star-laden darkness. Growing up in the pitiful, downtrodden slums of Denair, greatness wasn't expected of him, but Belaern couldn't help but desire greatness. As an illiterate, much of the educational opportunities of Denair were off limits to Balaern, but he learned to hone a magical prowess in studying the motions of the stars. In his studies Balaern was essentially reinventing the wheel, dabbling in stellar magic and those elemental affinities associated with the cosmos. Obsessively, Belaern would stare out at nightfall like clockwork when the last rays of sunlight had faded from the sky, and stare up at the stars. With a penchant for memory, Belaern learned to tattoo his observations upon his body and chart the stars. As aforementioned, childhood was miserable. Life in the slums was a daily struggle for survival, where over-breeding and murder filled the streets with the stench of blood and death. Those that learned to kill survived, while the corpses of the fallen littered the streets at night only to be carted away come morning. Belaern learned the anatomy of his fellow citizens by sight, taste, and smell, but only killed when necessary. The lower district was largely devoid of weapons, save what could be sloppily fashioned, so most learned how to become proficient killers with their bare hands. 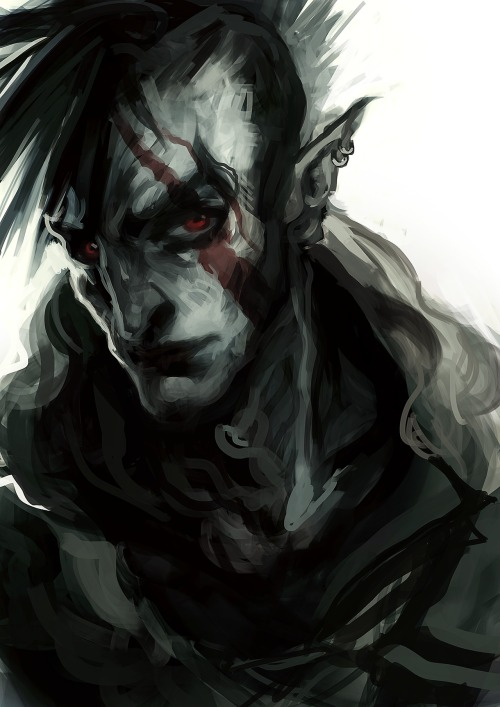 The shanties of Denair were a home, but a pitiful one-- certainly no home that Belaern could feel attachment towards. He always dreamed of leaving his birthplace, of escaping the walls of Denair to follow the path of the stars. Agility - She's quite dexterous and adept at moving, dodging and jumping. Tail - This long tail is partially prehensile, able to manipulate things but has no fine control. It is able to hold her weight and she's practiced in using it to trip people. Heightened Senses - She has eyesight, hearing and smell better than human. She can maneuver well in low and no light environments. She may notice things others might not because of these senses. Combat Touch - Her summoned elements last only a short time so this is the ability to touch an enemy at the right moment to deal damage. Tail Trip - using her tail to trip foes, usually by making a 360' spin. Staff - Mainly used defensively but will take a shot at foes she's tripped. Domestic/Maid - Practice in Cooking, Cleaning, Sewing and interacting with customers. Cantrips - Alice focuses on using minor magic 'tricks' that she could use without it sapping too much of her strength. While most users of magic work in getting stronger in the abilities that have, she instead learns new 'tricks' to add to her arsenal. None of them have big effects but the utility is impressive. Compass - Creates an arrow that detects more of a sample item. Detecting north require a magnet. Can also be cast on an existing compass changing detecting from north to sample item. Range based on how common item is (less common means shorter distance). Mending - repairs minor damage to target such as scrapes, scuffs, minor tears and cuts. Minor Panacea - cures minor ailments like headaches, toothaches, upset stomachs and minor colds and fevers. Think magic aspirin. Color, clean, or soil items in a 1-foot cube each round. Chill, warm, or flavor 1 pound of nonliving material. Toss - imbues small light target with the wind allowing it to fly. Ammo like arrows act as if fired. FATIGUE – Magic takes its toll on the mind and body after a period of time, causing the user to become physically drained/ tired. Do to the nature of her magic and the training she's received from the Ebonshade she doesn't have to worry TOO much about it. However, she's not always careful enough to avoid OVERUSE OF MAGIC. STRENGTH – Alice is fairly athletic for a user of magic though she's more agile than strong. In terms of just strength, she's a bit stronger than average but not impressively so. SENSES - Strong sounds, smells and visuals have a greater effect on Alice. Headaches, nausea and vertigo are possible from extended exposure. SOCIAL ISSUES - Alice sometime encounters problems with her unknown heritage, both from beast-kin and 'normal' folks. It's not an everyday occurrence but happens enough to be annoying. OVERUSE OF MAGIC - Since her cantrips don't have as great an effect on her as normal magic she tends to use them in situations she doesn't need to and tends to attract attention to herself. Physical Description: Alice is a beast-kin that stands 5'5" and weighs around 110 lbs. She has a lithe form with slightly digitigrade legs and a long tail with a length of fur at it's end. She had large eyes and animal ears and has short, fine fur covering her body. She tends to wear light and easy to move in clothing. She changes the coloring of her fur, hair and clothes with her cantrips, often forming patterns in her fur. Background: Alice grew up on the streets of Denair and would have been another orphan trying to scrape by if she hadn't been found and brought to The Wilted Rose. A few tests later and she was brought into the Ebonshade. She'd been happy to get a roof over her head and food in her belly so she put everything into her training. Her training didn't take up all her time though. She also helped out in the Wilted Rose, starting out with cleaning, doing dishes and working her way up to cook, maid, waitress and bartender. She has done most of the jobs there and done them well. Overall she was pretty happy. Abilities/Power: Arthanil has not let his elvish culture slip from him and he is fluent in Elvish language. He was trained heavily in ranged weapons though his focus was on the crossbow. Arthanil has some merchant experience learned from his father when he ran his wheelwright shop. Arthanil has done some hunting when the gates opened and he is a good shot and brought some food into town. Arthanil has tried to continue his fathers shop but hasn't really done a good job at making wheels. Weakness/Struggle: Arthanil isn't very talented in the common tongue and is prone to misunderstandings and using words wrongly. He spends too much time at the Withered Rose and will often drink to much. He gets irritable without alcohol. He is not very strong and tends to take to supporting the stronger fighters with a barrage of bolts. Arthanil is also stubborn and reckless at times he is drunk or sober for long lengths of time. Arthanil tends to be very blunt in conversations with others. Physical Description: An average sized elvish man standing at 6'4" Arthanil isn't very striking. Having dark brown hair and brown eyes and pale almost ghostly skin. His ears the average pointed elven ears and is the only thing that makes him stand out at all. His body is thin and wiry making him quick on his feet and agile. Background: Arthanil was born in Denair to his parents who were merchants in the city at the time the gates closed. All he has known was the city and he lived a good life within the city and never wanted to leave. Even if he could leave he probably wouldn't have left without a purpose. His parents were older when they gave birth to him and he was a miracle baby as was said. His mother died giving birth to him and his father taught Arthanil all the things he needed to know about his culture. One day he encountered the Ebonshade as he was exploring the city and took him in to begin training in ranged weapons. His father had actually been the one to arrange it for him and he held a grudge against his father for atime. His father died 3 years later when he was 16 and Arthanil finally understood his father's motivations. He trained with the Ebonshade further from then on as that was his fathers wish. His knowledge of elvish language and the common tongue would often get mixed up and he would often use a slang language of the combined languages to speak. He further trained in ranged weapons and gained an affinity for the crossbow. He gained an affinity for alcohol after the death of his father due to the immense sense of guilt for the venomous arguements with his father. He became a talented warrior under the Ebonshade and a loyal follower. Not many people in town have gotten to know Arthanil in town as he was often in the shop with his father or with the Ebonshade. Those that have gotten to know him either see him as a drunk prone to rage issues or as a talented hunter and warrior. Arthanil doesn't have many friends due to his rude nature and reckless behavior. Those he has befriended are people he has kept close to him. Gear/equipment: He is dressed in light armor and a light helmet atop his head. He carries a light crossbow and an adequate amount of bolts to supply him. Also tends to carry rations for traveling. This message was last updated by the GM at 23:05, Wed 27 Aug 2014. Hallam's study of medicine and surgery during much of his life has granted him a fundamental understanding of human anatomy, diagnostic procedures, basic herbalism, as well as medical techniques and their applications. In addition, his tutelage under the Clerics of Cerennos gave him literacy in Common, as well as a general curiousity of all things written and ancient. His training also resulted in steady, dextrous hands, and the ability to remain calm even in the most urgent of situations. While Hallam's early monastic life and medical study have granted him a number of useful abilities, long nights hunched over manuscripts did little to benefit his physical fitness. He is physically weak, frail, and has little to no experience with weapons or combat in general, beyond that which was recorded within the manuscripts themselves. Hallam Swales stands at nearly six feet tall, both his hair and his eyes a dark brown. His face is thin, much like the rest of him, and despite the serious nature of his work he is always quick to smile, or laugh at a joke (even if it isn't all that funny). He typically wears plain streetclothes beneath a jerkin bearing the emblem of Cerennos. Hallam Swales was born to a woman of low birth and questionable virtue in the city of Denair. The prospect of discovering the identify the second half of the pair was a daunting, if not impossible, task and his mother's ability to provide and care for an infant during these troubled times was extremely limited. Instead of even trying, she took him, still in his swaddling cloths, to a group of clerics dedicated to an all but forgotten god, Cerennos, the patron of Healing and Medicine. While the elders were reluctant at first to accept the infant, they ultimately capitulated when they learned the alternative was a slow and painful death by starvation. While the Clerics of Cerennos were neither wealthy nor numerous, their talents with healing granted them respect from the general population, particularly from the lower districts as they did not charge for medical care, subsisting on donations alone. Hallam's early learning included basic reading, writing and mathematics. His competence and dutiful persistence resulted in the Clerics beginning their instruction in the arts of medicine; how to stitch a wound, remedies that could be fashioned with herbs, and other such techniques. This slowly progressed into the study of anatomy, and eventually, surgery. At first he was sickened by the very concept of cutting someone open, but sitting in on autopsies and open surgical procedures quickly, if brutally, resolved Hallam's nausea and hesitation. During his early adulthood, he began to serve as a surgical assistant, before at the age of twenty-four being considered a competent enough healer to actually provide treatment himself. He continued to work at the hospital out of which the Clerics of Cerennos operated, as well as happily assisting at any triage facilities or clinics that opened up in the lower districts. It was at one such clinic where he attracted the attention of the Ebonshade organization. When Hallam learned of the dangers that its members were facing, especially with regards to the youths, he volunteered himself immediately. As he had not been taken in as a child, he swore oaths upon his god to reveal nothing of what he saw to those outside the organization, save that which he had been explicitly permitted to reveal. An amulet bearing the symbol of Cerennos; a single ruby in the shape of a teardrop.